The tiger or spotted-tailed quoll is the second largest of the world's surviving carnivorous marsupials (the largest is the Tasmanian devil). Male tiger quolls can measure up to 130 cm long and 4 kg in weight. Females are significantly smaller than males. The tiger quoll is found on the east coast of mainland Australia, but is rare. 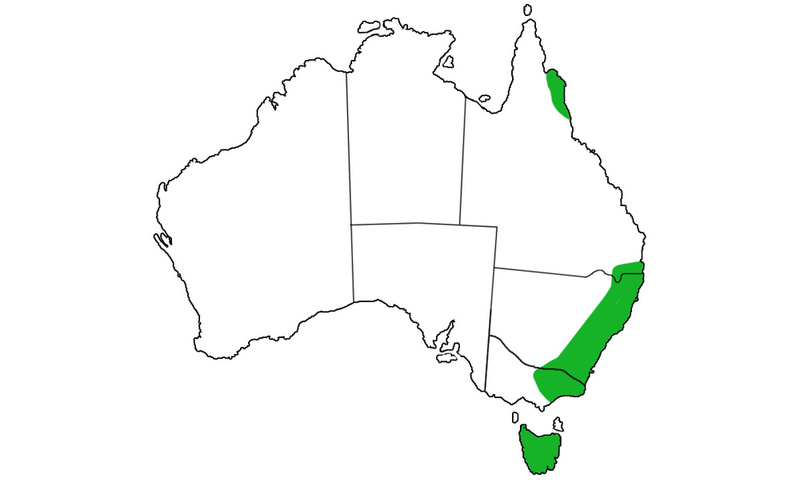 They can be found in northern Queensland, and from southern Queensland to Tasmania. The tiger quoll is now threatened throughout its mainland range. The tiger or spotted-tailed quoll is solitary and nocturnal. They are capable hunters, killing their prey with their powerful jaws. Prey consumed includes rats, gliding possums, small or injured wallabies, reptiles and insects. Breeding occurs in early winter with females giving birth to up to 6 young after a gestation period of 21 days. After about 10 weeks the young are left in grass-lined dens located in burrows or hollow logs leaving the female free to hunt and forage. By the end of November they are weaned (no longer suckling) and become independent of the female. The spotted-tailed quoll is the second largest of the world's surviving carnivorous marsupials (the largest is the Tasmanian devil). Male tiger quolls can measure up to 130 cm long and 4 kg in weight. The tiger quoll is found on the east coast of mainland Australia, but is rare. They are also found in Tasmania. Tiger quolls are capable hunters, killing their prey by biting on or behind the head. Prey taken by these quolls include rats, gliding possums, small or injured wallabies, reptiles and insects. Breeding occurs in early winter with females giving birth to up to 6 young after a gestation period of 21 days.